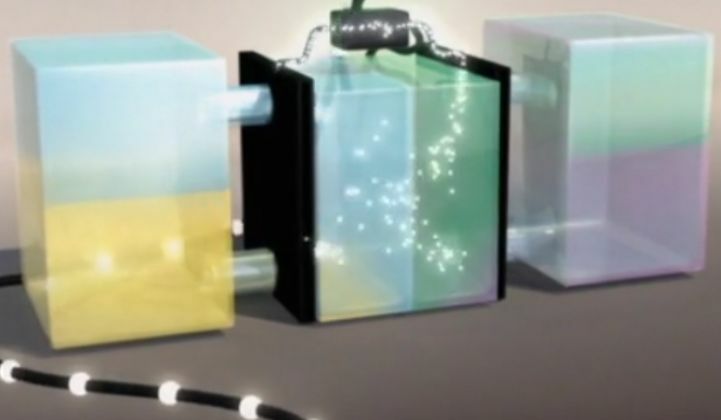 Energy Storage Systems wins $3.2 million in early-stage VC for “all-iron” flow battery. Flow battery technology might be gaining on its potential of delivering long-duration energy storage at lower costs than lithium-ion batteries. Flow batteries hold the promise of 10-hour durations, 10,000 cycles, minimal degradation and no limitations on depth of discharge. These energy-storage systems pump electrolyte through stacks of electrochemical cells. It's one of the few battery formats that might be capable of affordably storing energy for multiple hours at a time. And it's that potential for economical, long-duration energy storage that has lured VC investment and R&D -- but so far, the investment has yielded very few commercial, competitive flow battery products. Today, however, two flow battery startups are reporting new funding and new strategic directions as this high-potential technology looks to win a larger share of the growing energy storage pie. Energy Storage Systems of Portland, Oregon just closed a series A round of $3.2 million led by Pangaea Ventures along with Element 8 and other angel investors, with the aim of commercializing its "all-iron" flow battery. ESS has also been awarded approximately $4.5 million in grants from ARPA-E, the Oregon Nanoscience and Microtechnologies Institute, and Oregon Best. ESS claims its distinction and path to lower levelized cost of energy is the use of a low-cost and readily available electrolyte based on iron, salt and water. Like most flow batteries, the ESS product is focused on applications that require more than four hours of energy capacity and many cycles, with the goal of time-shifting bulk energy from wind, solar and other generation sources. The initial product from ESS will be a 125-kilowatt, 1-megawatt-hour flow battery. Andrew Haughian, partner at Pangaea Ventures, told GTM, "We really think that the long-duration market is the huge opportunity in energy storage. We think that the short-duration markets that are going full steam right now are just the tip of the iceberg." Craig Evans is CEO of the company, and Julia Song is CTO. Both worked at former fuel-cell aspirant ClearEdge Power. There are 76 flow battery projects big enough for the DOE to take note of, about half of which are operational, for a current grand total of about 20 megawatts, according to the agency's energy storage database. Another 50 or 60 megawatts are listed as under construction or announced. Many of these are demonstration projects. GTM Research expects the U.S. to deploy 220.3 megawatts of energy storage in 2015 -- predominantly utility-scale and predominantly based on lithium-ion batteries. Boston-based Vionx Energy (formerly Premium Power) was founded in 2002 and recently raised about $58 million from VantagePoint and Starwood Energy. Bobby Kennedy Jr. is on the board. Vionx just announced an "ecosystem" of firms to launch and commercialize its flow batteries. Six companies -- UTC, Starwood Energy Group, Siemens, 3M, Vantage Point Capital Partners and Jabil -- are looking to "license, finance, manufacture and deploy the energy storage system." The Vionx vanadium flow storage system was developed by researchers at UTC. Siemens will serve as the EPC for future projects. David Vieau, Vionx’s CEO and former CEO of lithium-ion battery maker A123 Systems, told GTM that when it comes to utility and power customers, "Everything they do is about 20 to 30 years, not five years." Ravi Manghani, GTM's senior storage analyst, notes, "Lithium-ion battery technology hits a limit at four hours. If there is any value in long-duration storage, flow batteries can deliver energy for up to six or 10 hours. Emerging battery technologies such as zinc-aqueous could also compete with flow batteries on a long-duration, cost-per-kilowatt basis. Where flow batteries underperform is in efficiency, with an energy-in to energy-out ratio in the mid 70-percent range, compared to the mid-to-high 90-percent ranges for the best lithium-ion cells." "The magic is in the electrolyte," said Manghani. GTM Squared, GTM's new premium service, is taking a deeper look at flow batteries in a just-published first installment of a three-part series.